It has just been announced that Nottingham is England’s least car dependent city. How did my home town win? Well, its compact, we have two award winning bus services (one has free wifi on many services) and an excellent modern tram that services over 10 million passengers a year. The local council have made big efforts to publicize the use of the canal towpath as a walking/cycling route connecting the suburbs and the city. The centre is compact with plenty of places to lock your bike up. As a young family of four living in an inner city area all our needs are met. We walk in to the city, shop locally (no big super markets or out of town shopping centers). Our push chair is often loaded with kids shopping and other stuff. I commute to work by bicycle and train as we are a short distance from the station. Every thing is on our door step. If we go out for dinner a selection of great restaurants and cafe bars are with in walking distance. Our children are used to walking and we rarely use or car. Actually its not a car, its a small van with seats in. We used it loads over the summer to travel on our holiday tour of the UK. But the main reason we have the vehicle is for my gigging. Bass amps are heavy. Although gear has got lighter in recent years and I have used taxis to move my rig, out of town gigs (which mine mostly are these days) necessitate the used of a vehicle. 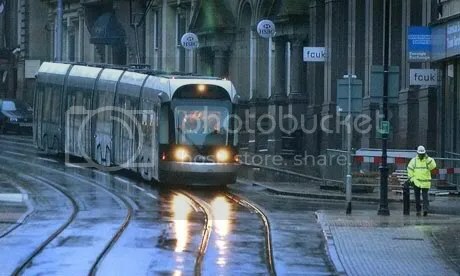 I would love to use services like Street Car, but the nearest is 70 miles away so its out of the question. I’m proud of Nottingham’s new status. I’m proud to live in a bright and vibrant city where public transport is widely used. Now if could just sort out more graffiti and city wide free wifi I would be a happy man.